Learners and teachers at the Tshiavha Primary School in Limpopo have not let a shortage of water supply affect their day-to-day learning activities. With help from the University of Pretoria's Department of Geography, Geoinformatics and Meteorology, the school has combined science with nature and created its own water supply out of fog. The project has not only helped the school, but also benefits the entire community. Several schools and communities in Limpopo have limited access to water. This affects the health of thousands of people in the province. In an effort to ease this problem, the second-year meteorology students at the University of Pretoria started a project, which traps water from fog. The Tshiavha Primary School is situated in a mountainous area, which attracts a lot of fog. There is no formal water supply in the area and residents have been highly dependent on water tankers to supply water to the community. The fog net project has set up threemetre high nets around the school to capture water. The nets consist of three wooden poles, which are nine metres apart. Steel cables stretch horizontally between the poles, over which a double layer of 30 per cent shade-cloth is draped. A gutter runs along the bottom of the shade cloth to channel the water into a storage tank. 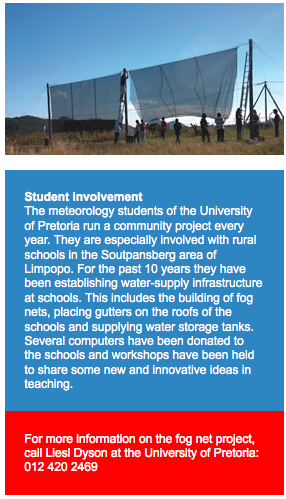 The school's fog net traps around 2 500 litres of water per day which is more than enough for the learners to drink. To increase the water supply, the fog net project from the University of Pretoria has also placed gutters on the school's roof to trap even more water. Before the fog net was installed, the school had serious problems caused by lack of clean water. Learners and villagers had to use water from a nearby river. This was very unhealthy since the water is polluted and can spread waterborne diseases. The school also started a garden that is irrigated with fog-harvested water and the the community is being trained to look after the nets. A number of other sites where more nets can be installed to trap water have been identified. 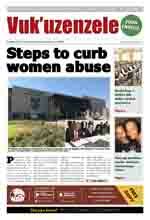 The Department of Water and Environmental Affairs has pledged to support the initiative at all suitable sites. Neighbouring communities have also jumped onto the science wagon and have asked for assistance to install nets in their areas to trap water.